Sanjay Dutt's Horoscope - Destiny's Child. So for a change, today a Celebrity Horoscope. Who else but our own Sanju Baba :) . a.	Scorpio is 8th sign of Zodiac. Hence, it represents the energy and things related with 8th house of sudden events, mysteries, secrets and transformation. So, when that zodiac sign becomes Ascendant, which is our life path, our life path gets filled with sudden events, transformations, mysteries and secrets etc. b.	Scorpio and Aquarius are two signs which show a karmic backlog towards other people in our life and the reason is Scorpio and Aquarius are 2 signs which are co-ruled by the nodes of the Moon. So, Scorpio is ruled by Mars but it also has a co-ruler Ketu. Likewise, Aquarius is ruled by Saturn but it also has a co-ruler Rahu. Rahu and Ketu show our Karmic Debt from past life. Like, things which we already achieved and things which we could not achieved in our past-life despite having sincere desire to achieve it. So, in a nutshell, people born with Scorpio and Aquarius Ascendant are born to pay-off their karmic debt. So if a Scorpion has ANY regret about things going in a particular direction or wish you have taken this/that decision or wish this/that person had been more honest in your life, then JUST LET GO. You have taken birth to pay-off your karmic debt towards these people and by their behaviour actually all people helped you to pay-off the debt. You should be happy that you won’t have to take another birth to deal with these people again. All done and dusted. 2. As I said, Scorpio is sign of transformation and we all have seen what kind of transformative life Sanjay had lived. From Drug Addiction to Stardom to Rifle Case to Stardom Again to Imprisonments, he has seen all and have always come back. And that's the spirit of being a Scorpion. They never lose hope and always bounce back. Now, Scorpio's lord is Mars and Ketu. 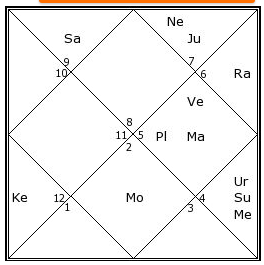 Mars is in 10th house and Ketu is in 5th house. 5th house is Creativity and 10th house is Career. So, his life revolved around a creative career. Actually, if we look little bit in detail then Mars and Ketu both represent Weapons and explosives and 10th house is also house of Government and Law. So, his life also revolved around a Weapon related case which happened after one of India's biggest Bomb Explosions Attack and after that he had a very long date with Government and Law. Now, let's cover up his chart through all the planets. Sun - Sun is lord of 10th house (Leo) of Career & Father and sits in 9th house of Higher Education, Far Distance Travels and people of different ethnicity. As Sun is going 12 houses away from the house it rules and 12th house is house of loss, it shows that he had loss of his father's company due to higher education when he was sent to boarding. It also shows that for the purpose of his career, he had to travel distant places and live with people of different backgrounds. Though, he went away from his father, as Sun is well placed in the house of Gurus, it shows that his father was like his Guru. As Leo is sign of Creativity, it laid down the basic foundation of following a creative career. Moon - Moon rules 9th house of Higher Education, Far Distance Travels and people of different ethnicity and sits in 7th house of Spouse, Masses and Relations. Moon is exalted in 7th house. Shows great emotional relation with Mother. Mother was always his support. Also shows that spouse is from a different ethnicity and we all know that all his wives, at different times, were from a different culture. This also shows his popularity within masses. If anyone has followed his Career then for 1st 10 years, there was only 2-3 movies which made big on Screen but he always remained popular among masses. People always wanted to see him on Screen. Mars - Mars rules 1st house of Life Path and 6th house of Obstacles and sits in 10th house of Government, Law, Career and Father. It shows that his life path was all about dealing with obstacles with things related with Law and Government. Mars in Leo in 10th house shows that not only he but his father was also very much strong-willed person and determined with his ideas. It also shows that he was willing to take up any challenge for his career. Also, shows support of Father in matters of Career and Law & Order. Mercury - Mercury rules 8th house of Transformation, Inheritance, Change and 11th house of Earnings, Income and sits in 9th house of Religion, Teaching of Guru and Father and people of different ethnicity. It shows that he overcome all the turbulent circumstances of his life through a stronger faith in God and through teachings of his father. It also shows that his earning and income came while working with people of different ethnicity in some of the most intense and turbulent roles. If we look back, Sanjay Dutt will always be remembered for movies like Naam, Sadak, Vaastav and many such movies, in which he played roles of Gangster/Criminal, a very much 8th house stuff. Jupiter - Jupiter rules 2nd house of Wealth and 5th house of Creativity and sits in 12th house of imagination/foreign lands and creative pursuits etc. 12th house becomes important for any creative career as it is house of imagination. So, his wealth came from Creativity and Creative Pursuits. This position also shows his inclination towards Drugs and Alcohol as Jupiter rules the 2nd house of things we like to eat/drink and it sits in 12th house of escapism, represented by Drugs and other such substances. As 12th house also represents Prison, it is not surprising that his recent imprisonment started when he entered Jupiter AD. Venus - Venus rules 7th house of Spouse and Relation and 12th house of Foreign Lands and sits in 10th house of Career. Venus, a planet of creativity, is in Leo, a sign of creativity. So, it gave him a career in creative field. Also, it links his wife from Foreign Lands and from his career. As we know, all his 3 wives were from the same profession and 1st one was from Foreign Lands too. Saturn - Saturn rules 3rd house of communications and 4th house of Mother and sits in 2nd house of Family and Wealth. It shows his limited company with his family as he was sent to boarding school. Also shows that his wealth is coming from self efforts and skills and communications. Saturn aspect on own sign in 4th house makes 4th house strong means gives a strong relation with mother. Rahu - Rahu is in 11th house of friends, earning and income. We all have heard his stories of how whole bollywood treats him as most beloved actor. It seems he is the only actor in bollywood who has no enemies. It also shows his status of being super-rich as Rahu exploded the results of 11th house of income. Also, Rahu co-rules the sign of Aquarius in 4th house and going 8 places away from its sign shows the death of benefit from home. It means he spent majority of his life away from home, which is understandable. Ketu - Ketu in 5th house of education, children etc would separate him from these things and it did. He was in college when he decided that education is not his cup of tea and requested his father for break in movies. 5th house represents 1st child and he remained separated from his 1st child who lives in USA. Then why Ketu didn't separate him from Creativity? That's where the concept of Jeeva Karaka and Ajeeva Karaka works. Every planet effects the living significators of a house, and not non living significators. Like, Ketu in 10th house may separate person from Father but if he puts effort than he will have some or the other career, right?, which is another signification of 10th house. Hope this gives summary of most turbulent life of Bollywood Superstar.